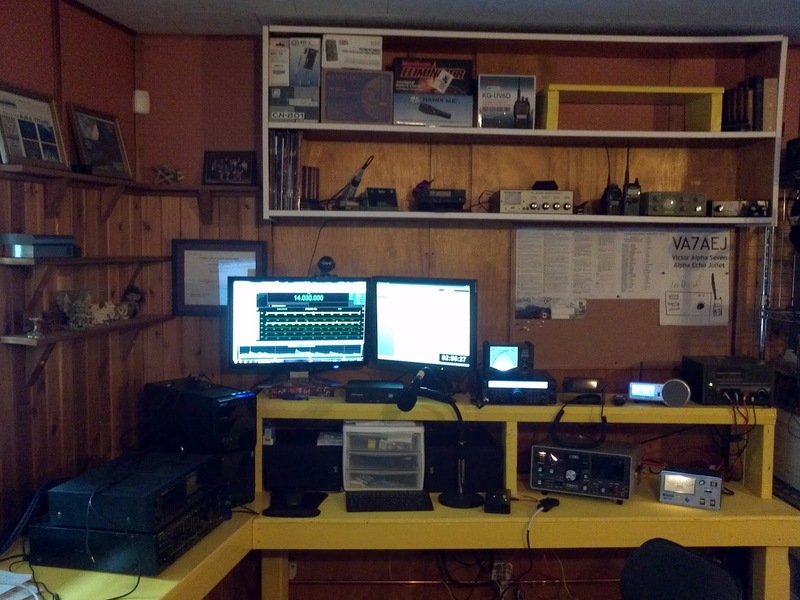 Latest photo of the shack (top). Scroll down to see the evolution. 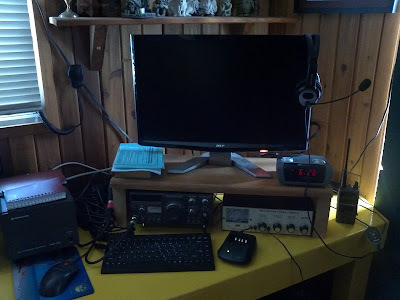 July 2018 - Four HF Radios, two digital nodes (C4FM Yaesu Wires-X & D-Star hotspot). July 2018 - Handheld collection and charging station. All units wired into a single power source with switch so I can turn it on once per week, charge for a few hours and then power off again. 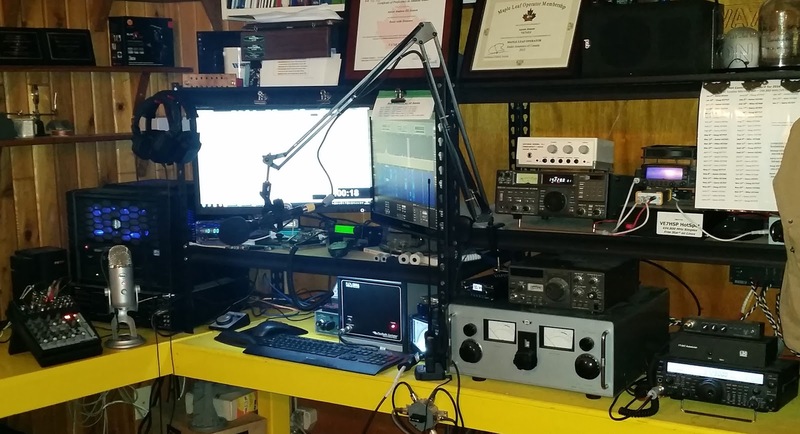 June 2017 - Four HF Radios, one Yaesu Wires-X Node, one D-Star Hotspot, plus the new Elecraft KX3 & PX3. Currently enjoying digital VHF modes C4FM and D-Star, while on HF I've been making a lot of contacts on WSPR. 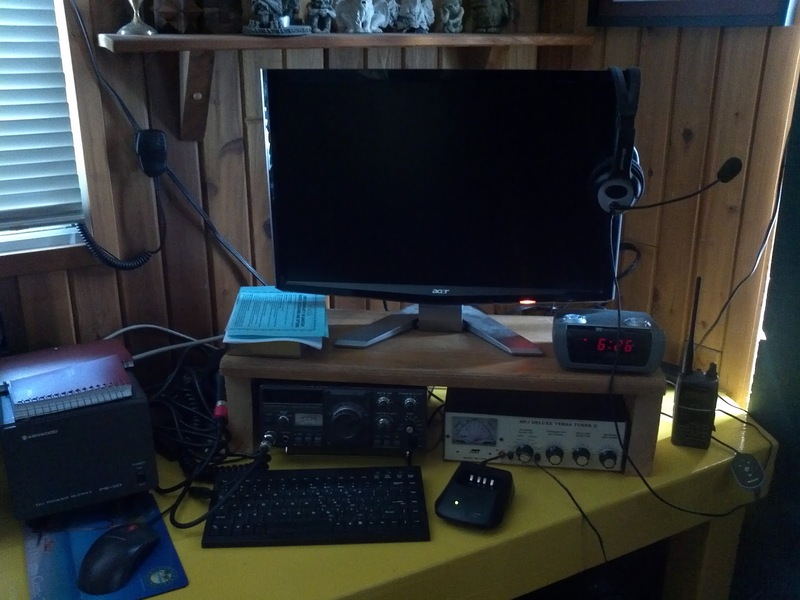 Field Day Weekend 2016 - I'm up to 5 HF Radios, D-Star Hotspot, Dual-band mobile. 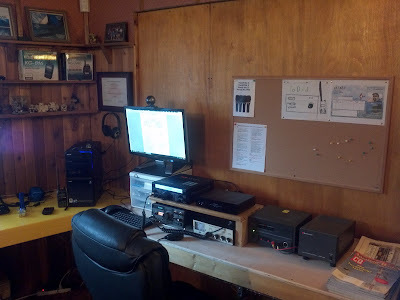 The most recent addition was the 10 channel mixer on the far left of photo, it's much easier to keep track of all the audio coming out of all the radios, plus a little bit of EQ if needed..
April 2014 - Added new black metal steel shelving and rearranged LED lighting. Added ICOM IC-2300H, triple 12v switch panel to allow for on/off switching of 3 accessories without their own built in switches (callsign light, etc). 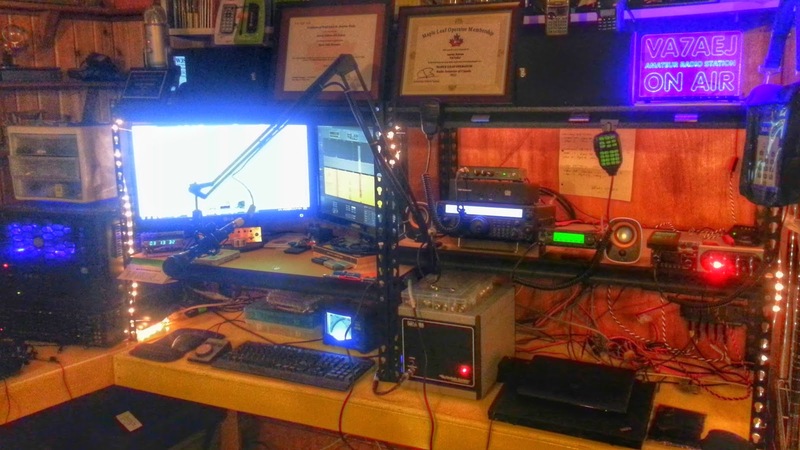 Jan 2014 - Heil mic, boom, and shockmount. 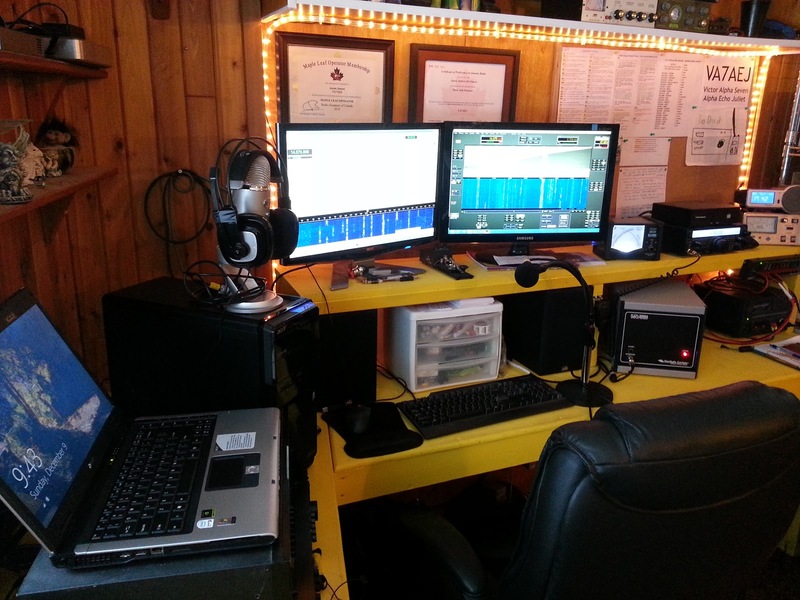 Laptop and Rigblaster Advantage for the FT-847. X1M Platinum QRP radio with Tokyo HyPower tuner and Signalink USB. Cold war display tube clock kit and led 'On Air' sign. 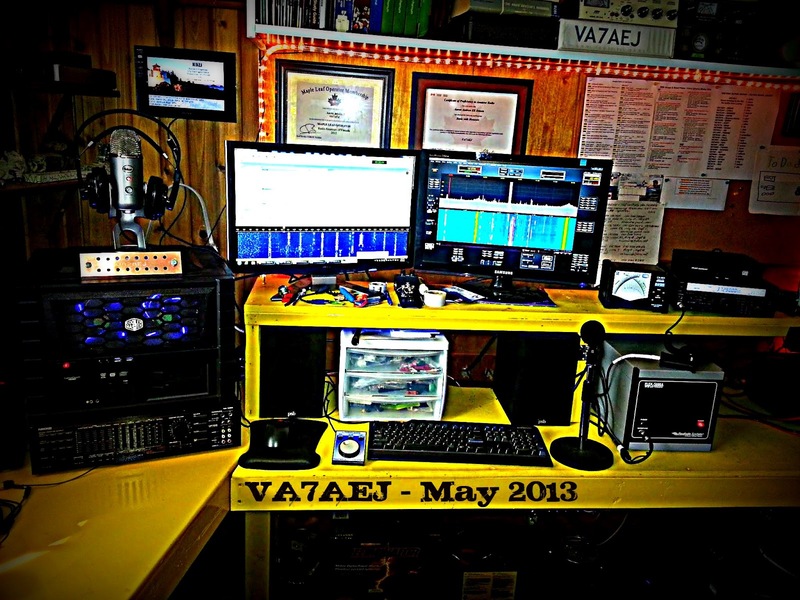 May 2013 - HAF XB case for the new PC, Flex Control USB, Digital picture frame for eQSL cards. and my RAC Maple Leaf operator certificate. March 2012 - Built more desk, and added a new radio, tuner, and power supply.